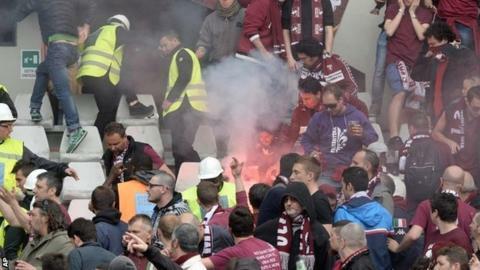 At least 10 Torino fans were injured when a paper banger exploded during the home derby against Juventus on Sunday. The missile was thrown from the Juventus end in the first half and caused splinters from seats to injure home supporters - a second explosive thrown later on hurt another fan. Before the match, hundreds of Torino fans threw objects including bottles, eggs and stones at the Juve team bus. Torino won 2-1 to earn their first derby victory in 20 years. Juventus could have secured the title if they won and Lazio lost their game, but that ended in a draw. "This was a deplorable episode of serious violence," Juventus sporting director Beppe Marotta told La Repubblica. State broadcasters RAI said two fans had been arrested.